It’s hard to escape any form of communication in a world littered with signs and images. Offline or online, information or advertising, monologue or dialogue – every day is ruled by some form of exchange. So much so that we don’t even realize it’s happening. How has it become so subliminal? Perhaps we’ve become so used to this overload of data that we’ve developed an indifference to it. For sure is that it is under these conditions that graffiti thrives – building on a secret competition between rival signers. The act of spray painting is not necessarily political in the sense of criticizing current political issues. But it reflects a society driven by desires provoked through manipulation. Critics complain that graffiti is nothing more than scribblings and letters. But is it less meaningful than all those billboards and posters decorated with logos and brand names? KAWS entered our urban landscape as a graffiti writer in the early 1990s. He left his mark on everything from water towers to freight trains. Then one day, he imprinted his writing on to advertising campaigns. Fascinated by their provocative appeal, he developed this approach further, eventually focusing on ads inside phone shelters and bus stops. The result is not necessarily more or less aesthetically pleasing, but rather, an intervention that questions our perception of everyday life. And it also puts the spotlight on the art, and KAWS himself. 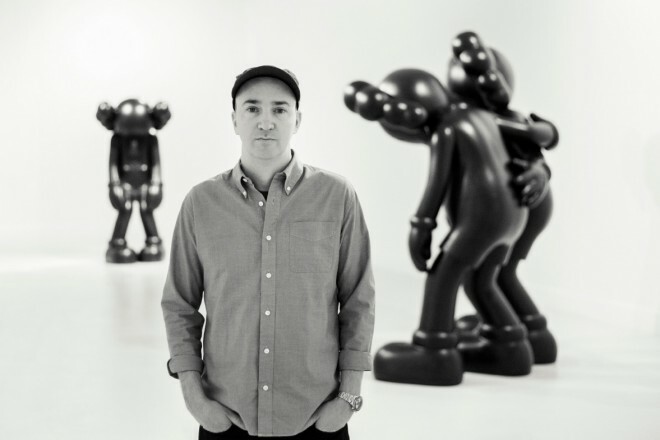 Today, almost twenty-five years later, KAWS can barely believe how his life and career has evolved. He is now one of the pioneers of the Art & Toys movement, filling the gap between art and commerce through collaborations with brands such as A Bathing Ape, Supreme and Nike. He also opened ORIGINALFAKE, a store in Tokyo that sold art products and clothing, while painting canvases that exhibit in galleries and museums worldwide. We sat down with the American artist to discuss the early days of his career, Pharrell Williams‘s influence, and doing business in Japan.